If you’re reading this article you’ve probably already heard about the effects of Phenibut. Maybe you’ve tried it yourself and are contemplating something new. If you’re not yet completely sure about what phenibut is, read through our Phenibut guide here. Phenibut comes in two forms. Phenibut F.A.A. is the free amino acid form of Phenibut. In other words, it's pure, free Phenibut without anything else. Phenibut HCL is the hydrochloride salt form of Phenibut, produced by reacting free Phenibut (the F.A.A. form) with hydrochloric acid. Almost all Phenibut offered on the market is Phenibut HCL. In the HCl form, Phenibut (an amino acid) is a zwitterionic HCL salt. A zwitterion can also be called a dipolar ion because it has both a negative and a positive electrical charge. On the upside, the usual Phenibut HCl form is easy to handle. This is because it crystallizes easily and has excellent water solubility. On the downside, dissolved Phenibut HCl is highly acidic, sour / metallic to taste. It is also irritating to mucous membranes and damaging to tooth enamel - causing it to be unsuitable for sublingual administration. Even when completely pure, Phenibut HCl is only approximately 83% Phenibut molecules by weight, with the other 17% being HCl. Phenibut F.A.A. is Phenibut in its free, amino acid form. It is close to neutral pH, making it very suitable for sublingual administration. Phenibut F.A.A. It has a mildly bitter taste and is moderately soluble in water. It is highly pure: more than 99.5% Phenibut molecules by weight (actually, no impurities at all are detectable by HPLC). 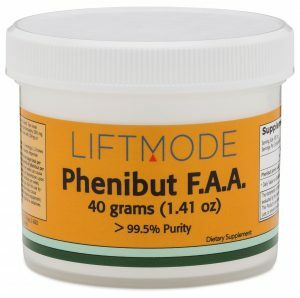 Phenibut F.A.A. is a fine white powder and is, therefore, less dense than the crystalline HCl form (an equal mass of Phenibut F.A.A. occupies approximately twice as much volume as Phenibut HCL crystals). When consumed in the usual way, Phenibut F.A.A. is about 15% more efficient than Phenibut HCl, but otherwise has few advantages. However, when consumed sublingually, Phenibut F.A.A. is as much as 3 fold more efficient by weight (only 1/3rd as much is needed for many folks). Also, the sublingual route allows Phenibut F.A.A. to be absorbed more rapidly, allowing the benefits to take effect a bit faster. Read what people with social anxiety say about Phenibut! If you’re considering the argument about Phenibut FAA vs Phenibut HCl, you might have some new ideas to think about. It seems that there are advantages and disadvantages to both of the common forms of Phenibut. Phenibut FAA definitely comes out on top in terms of efficiency and value for money. Unless you really like to dissolve your phenibut HCl in water, we’d definitely recommend trying Phenibut F.A.A. on your next Phenibut purchase.